Cat 3 Fitness and Health: Women's and Girls' Jogalong on the first Sunday of every month! Women's and Girls' Jogalong on the first Sunday of every month! That will be this Sunday 1 August - come along to Weston Park in Yarralumla and join in the fun at the Women's and Girls' Jogalong. Get there at 8.30am to have time to register (cost is about $6 ) and so you don't miss out on the very fun warm up aerobics at 8.45am. Staggered starts start at 9am, usually it's the 3km walk followed by the kids' mini-jog and then the 6km runs start around 9.30am. Weather permitting I will be there with my Mum and my friend's mum to enjoy the 3km walk. 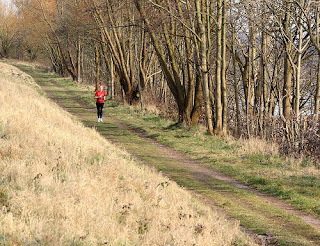 The club runs regular running events that are open to members and non-members alike - just check their website in the link above for events. Cool Running Australia keep an up-to-date list of running events, including this weekend's (Saturday 31 July) Bush Capital Bush Marathon.